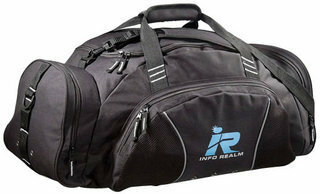 Travel Sports Bag - 600 denier polyester; large main compartment with U-shape opening; adjustable shoulder strap; wide pockets on each end; slip pockets in left; zippered front pocket with plastic key clip. Colours available - black, navy/black. Decoration - print, embroidery, badging.